Healthcare delivery is becoming more coordinated, collaborative and centered on the patient. Healthcare sector is focusing on the strategies and technologies that reduce costs and enable the organization evolves new operating models to scale, bring together, and leverage financial and clinical information to drive performance and quality. Healthcare stands to derive the greatest benefit from the seamless capture and transmission of data. IT systems can be employed to model medical, nursing digitally, and administrative processes – not just as an end in itself but to cut costs, accelerate workflows, and improve care. Changes like healthcare delivery making it more personalized, precise, collaborative, evidence-based and outcome-driven and integrated. The healthcare provider market consumes a wide and expanding array of solution segments. The solution map details the broader solution areas (foundational; corporate and institutional administration; revenue cycle; core care delivery; ancillary care delivery; and mobility) that contain individual solutions. The figure below details the healthcare providers’ solution map. Today, healthcare provision is primarily organized centrally and is concentrated on the provider. Moving forward, the focus is on the individual, both organization and treatment will focus on patients’ personal needs. Also, with digital communication tools and remote monitoring technologies, it will be possible to treat patients in their homes – cutting costs and improving the quality of life. Healthcare providers who currently operate in isolation, and store patients’ data in their local, siloed IT systems, will increasingly share information and insights. In the future, seamless data exchange and secure direct communications with patients and healthcare providers will avoid the duplication of tests and examinations. 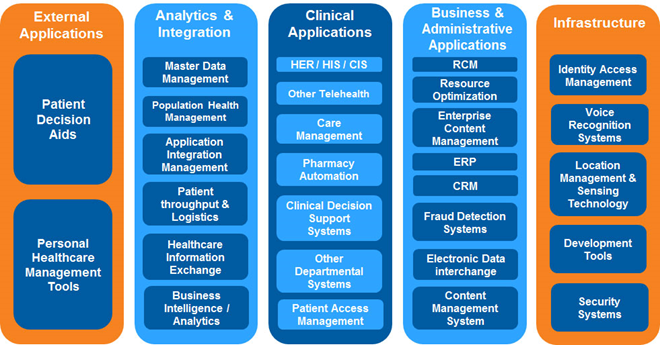 This is where SAP for Healthcare might fit Solutions comes into the picture. SAP Healthcare Solutions help to transform patient care and enable you to deliver personalized, cost-effective care. SAP solutions cover everything from healthcare analytics and electronic medical records (EMR) to health information exchange (HIE) and beyond. You harness leading technologies to build effective information systems, practice evidence-based medicine – and improve the overall patient experience. SAP’s end to end Solutions for the Healthcare organizations deliver high – value care and the personalized experience while achieving operational experience. The SAP solutions connect processes in the healthcare industry by integrating horizontal lines of business with healthcare solutions on premise, in the cloud, and through mobile devices. Patient Care: Enable a personalized healthcare experience with integrated patient access, billing, and clinical records. Healthcare Analytics and Research: Use advanced analytic applications to drive insights for better outcomes and research. Finance: Gain forward looking, organization wide insight from automated, real time financial processes and analytics. Procurement: Streamline sourcing and procurement processes to drive compliance and control while cutting costs and risks. The difficulty in developing a business case necessary to procure funds for an enterprise healthcare solution and the lack of adequate staffing to deploy, sustain and develop the system. Arm’s length reach – Makes communication and required attention far easier. Local vendors are giving existing and local customers due attention. With YASH’s deep understanding of the healthcare industry across geographies and time-to-market needs, we focus on operational efficiencies, risk reduction, and customer service to provide incremental and cost-effective solutions. Our solutions help deliver personalized care at an optimal cost to patients. We deliver best in class best-in-class technology, consulting services and insights for healthcare and life sciences organizations worldwide. We help drive business outcome, and IT spend by re-imagining new business models which optimizing operations and enabling technology innovation.